ALSO READ: The NASDAQ Glitch: What does it mean? It’s been a minute. But don’t worry…The Intern is back! I sat back and let my “boss” have the limelight for a couple weeks there. I gotta admit, his investment decisions were pretty sound. Albeit explained with a tad less wit than yours truly. But wit can only take you so far. In the end, it’s stock performance that matters. And I’m losing in that category. Well, we both are. But I’m losing more. After just over a month, my investments are down a total of 0.31%. But as I’ve said before and I’ll say it again, this ain’t no day trading league were running here. We’re in it for the long haul, and the investments I’m making are sure to get hit with market fluctuations. However, I believe these companies will prove their worth over the long term. Well, pretty much everything has fallen over the last few weeks. See it seems we’re currently living in a “good news is bad news” time period, where strong economic data pushes stock prices lower. Why? It’s because of quantitative easing (QE), something I discussed at length in this here post. In short, it is the Fed’s Band Aid fix for our struggling economy. But as good data comes out, eluding to the fact that the economy is getting stronger, the fear of the Fed ripping its QE Band Aid off becomes more and more realistic. “Luckily”, some bad economic data came in this morning: there was a 7% drop in durable goods orders this month. With that, the S&P 500 and Dow Jones are up this morning. Yay? 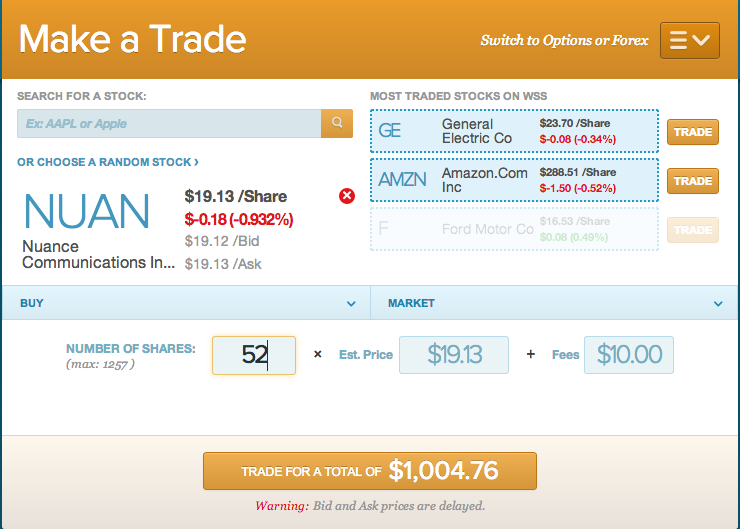 This is market fluctuation at its finest…a perfect example of why I’m investing over the long term. It’s near impossible to predict where the market is going. But over the long term, well-managed companies with good products and economic moats are the ones that will pull ahead from the pact. P&G: After Proctor & Gamble announced their solid 4th Quarter earnings on August 1st (which I discussed with the utmost intelligence and sophistication in my latest blog post), the stock jumped up around $2. But as the month has progressed, it’s slowly but surely fallen back down to its pre-earnings price. Questions still linger around the company, which has struggled with growth in recent years. News came out that the returning CEO A. G. Lafley is currently living in a “temporary residence”, reinforcing the idea that he’s simply an interim solution. (Seems like Band-Aid fixes are in vogue these days…) On the flip side, P&G announced some good news in the form of a new partner: Habitat for Humanity. This partnership will lead to the construction and repair of homes in 12 countries around the world. Good on ya P&G! AFL: Aflac has also fallen with the market over the past month. But the insurance leader is showing huge growth in its Japanese division. They recently announced that the number of agencies its added in Japan this year will be 20% more than the number it added last year. 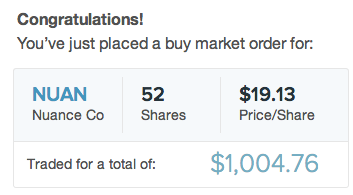 OK boys and girls, I think it’s time to add a new stock to my so far underwhelming portfolio. I’ve been deliberating over this one for a while, but I think I’ve done my due diligence. It’s time for action. Today, I’ll be investing in the voice technology company Nuance Communications. Voice technology is in its infancy: At least I think it is. So far, I use voice technology for very few things. Mainly to set my phone’s alarm at night when I’m too tired to do so manually. But I could see how it would take over so many of my actions in the near future. I think a big part of this will take place in the car. Having the ability to safely do everything you would on your phone while driving is going to be huge. Trust. Nuance gets that, and is leading the way: Nuance is the (unofficial) technology behind iPhone’s Siri, the voice recognition personal assistant. The company has also recently acquired Tweddle Connect, which offers in-car “infotainement systems”. Nuance already offers voice technology services in a number car makers like Audi, BMW, General Motors and Toyota to name a few. Watch for that number to grow. They’re undervalued: Nuance is currently in a transition period. They’re investing a large chunk of change in R&D, and strengthening their voice recognitions products with Natural Language Processing (NLP). They’re also changing the way they charge for their software, moving from a licensing revenue stream to an on-demand revenue stream. These recent transitions have made for recent weak earnings reports. The company’s income has dropped in the past 2 quarters; and their stock price reflects that, falling from $24 earlier this year to around $19. But this short-term slow down of growth is an investment for the future. Investors with a long-term horizon will benefit from buying in to Nuance at this deflated price. For questions, comments, complements, or if you just feel like telling someone about your day, hit me up in the section below. Or email me. To get fast and actionable investing information, sign up for Benzinga Pro and get real-time news alerts on the companies you care about. Previous articleThe NASDAQ Glitch: What does it mean?